Aerobic exercise has marked effects on cognitive function, even in an elderly group at risk for Alzheimer’s disease. Aerobic exercise may not be suitable for certain groups, especially the frail or those at risk of falls. Exercise mimetics may therefore prove an attractive for treatment option the frail, who would benefit from exercise-induced changes in peripheral and central function. The polyphenol, resveratrol, rose to attention over the past 15 years as a possible explanation for the “French Paradox”. Resveratrol is a highly active polyphenol found in certain plants, such as grapes and peanuts, that provides protection from invading pathogens and environmental stressors. Since its discovery as an antioxidant in red wine, research has revealed many beneficial effects on the human end-organ function. These include anti-diabetic properties, cardioprotection, neuroprotection, anti-cancer effects, encouraged mortality and improved metabolism. We found a treatment regime of 20 mg/kg resveratrol for 18 d (5d/week) showed similar novel object recognition performance improvements in young healthy rats to those observed in an exercise programme of 1 h/d for 18 d (5d/week). This was paralleled with increased BDNF levels in brain regions associated with long-term recognition memory and circulating insulin and adiponectin, suggesting an involvement of these molecules in this enhancement. Data from monitoring animal weight changes suggest that resveratrol is a strong calorie restriction mimetic even with sedentary rats fed ad libitum on a normal diet. We developed a measure of spatial recognition memory that could be performed by young, healthy animals but that highlighted impaired performance associated with scopolamine administration. Daily pre-treatment with resveratrol for 7 days counteracted the memory impairment associated with scopolamine administration, allowing these animals to perform significantly above chance in the task. Daily treadmill running for 7 days before scopolamine impairment did not have any noticeable beneficial actions against this compound. 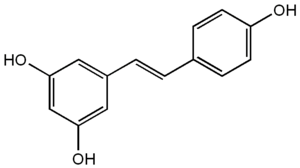 The beneficial effects of resveratrol indicate that this compound may act through the cholinergic system to produce evident memory enhancement. The different findings after aerobic exercise indicate that these external factors act through different pathways. We found that regular ingestion of 20 mg/kg resveratrol (5d/week) and forced running for 1 h (5d/week) in middle-aged rats improved learning and working memory, assessed regularly using a DNMS task. After 14 weeks of treatment regimes, and 13 weeks of DNMS training, animals that underwent resveratrol and running regimes showed faster recovery in DNMS performance after performance was impaired with a 7 day interval between task sessions. The long-lasting effects of resveratrol ingestion and forced running were not present 8 weeks after the regimes had ceased, suggesting that these regimes should be ongoing for continued effects.